A Shia militia battling on the side of the Iraqi army against the Islamic State (ISIS) has blamed the US-led coalition of shelling its fighters near the Syrian border – a blame the US has rejected. Kataib Sayyid al-Shuhada militia, known as close to Tehran, indicated that the US-led coalition collided with IS to attack positions of its fighters near the Syrian border. The air strikes according to the militia’s deputy commander, Ahmed al-Maksousi, came from Jamouna area in Syria, about 12 KM (about 7.5 miles) from the Iraqi border. About 40 fighters were killed and about 30 wounded according to al-Maksousi. The US-led coalition, which pounds IS positions in Iraq and Syria, Tuesday denied the allegations arguing that it did not carry out airstrikes in the area. Army Col. Ryan Dillon of the coalition, positioned in Iraqi capital Baghdad, pushed off claims in a twit. “Allegations of #Coalition strikes vs. Popular Mobilization Forces near #Iraq – #Syria border are INACCURATE. No Coalition strikes there ATT,” he tweeted. Iraqi Prime Minister Haider al-Abadi also took the side of the coalition saying IS was responsible for the dozens of deaths. “It seems that Daesh carried out a breach using artillery and car bombs,” Abadi said in a televised press conference in Baghdad, using the Arabic acronym of the terrorist group. ISIS, in an online statement, said it staged a three-pronged attack that included a suicide bombing, followed by fighters storming the militiamen’s positions. The group added that one ISIS fighter was captured, reports say. 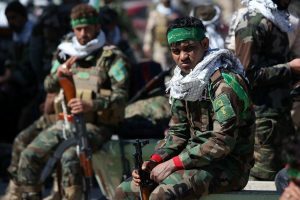 An umbrella of Shia para-military groups known as Popular Mobilisation Forces has been fighting with the Iraqi army to ouster ISIS out the country. Written by: Peter Mulvany on August 9, 2017. Posted by Peter Mulvany on Aug 9 2017. Filed under Gulf News, Headlines. You can follow any responses to this entry through the RSS 2.0. Both comments and pings are currently closed.